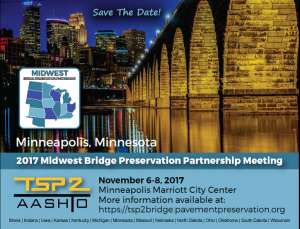 Bridge preservation case studies will be featured at the 2017 Midwest Bridge Preservation Partnership (MWBPP) meeting held at the Marriott City Center in Minneapolis, MN on November 6-8. The meeting will also focus on actions for deck and joint preservation and emergency response procedures for exceptional events, such as flooding, bridge hits and fire. Bridge preservation practitioners attending the meeting represent the States that are part of the Midwest TSP2 Partnership region: Illinois, Indiana, Iowa, Kansas, Kentucky, Michigan, Minnesota, Missouri, Nebraska, North Dakota, Ohio, Oklahoma, South Dakota and Wisconsin. At the meeting preservation practitioners from DOTs and other owners will be interacting with contractors, consultants, academia and manufacturers that have a stake in bridge preservation in the Midwest region. Manufacturers will also have an opportunity for showcasing their products and technologies. As with all TSP2 Bridge Preservation Partnership meetings, time will be dedicated to round tables where owners, consultants, academia, manufacturers and contractors can exchange information related to their experience with bridge preservation, underscoring challenges and solutions for extending the service life of concrete and steel bridges. MWBPP mission is to provide a platform for bridge preservation practitioners to exchange, promote and advance best practices, new technologies and innovation in the areas of highway bridge management, inspections, preservation and maintenance.